In this tutorial you are going to learn how to keep Skype from lowering volume. Note that it’s actually Windows that’s lowering the volume and not the Skype application. Sometimes when you use Skype, the volume of all other applications lowers during a phone call. To prevent this click on the Windows “Start” menu and select “Control Panel” in the list on the right hand side of the start menu. In the control panel window that pops-up, select “Hardware and Sound”. Step # 2 – Select “Do nothing” in the communications section of the Sound control panel. The “Hardware and Sound” control panel appears. 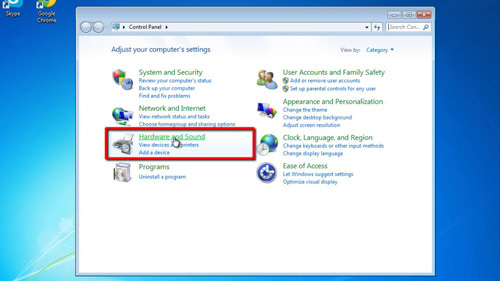 Click on the “Sound” option found in the list of choices in the right hand section of the “Hardware and Sound” control panel. A new window opens, titled: “Sound”. Select the “Communications” tab, and in this section, select the “Do nothing” radio button. Confirm this selection by clicking on the blue “OK” button at the bottom of this window. 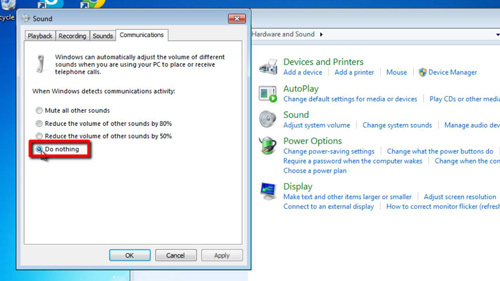 This is how to keep Skype from lowering volume.